The rotary dryer is a type of industrial dryer employed to reduce or minimize the liquid moisture content of the material it is handling by bringing it into direct contact with a heated gas. The dryer is made up of a large, rotating cylindrical tube, usually supported by concrete columns or steel beams. 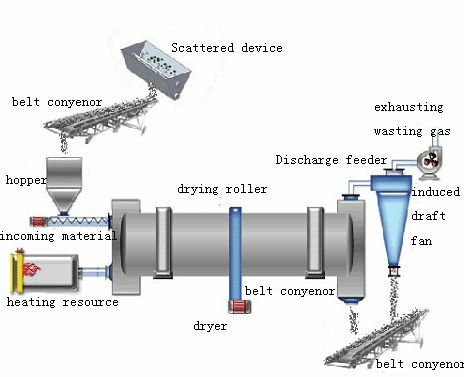 The dryer slopes slightly so that the discharge end is lower than the material feed end in order to convey the material through the dryer under gravity. Material to be dried enters the dryer, and as the dryer rotates, the material is lifted up by a series of internal fins lining the inner wall of the dryer. 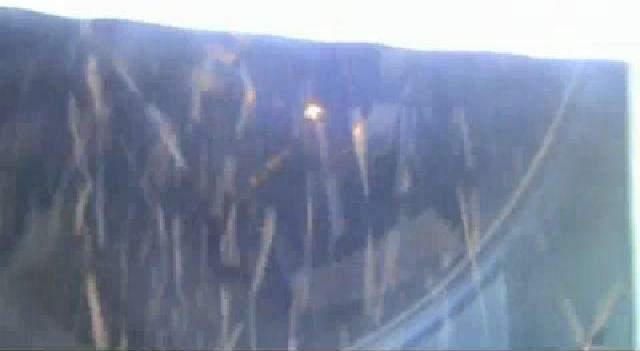 When the material gets high enough to roll back off the fins, it falls back down to the bottom of the dryer, passing through the hot gas stream as it falls. This gas stream can either be moving toward the discharge end from the feed end (known as co-current flow), or toward the feed end from the discharge end (known as counter-current flow). The gas stream can be made up of a mixture of air and combustion gases from a burner, in which case the dryer is called a direct heated dryer. Alternatively, the gas stream may consist of air or another (sometimes inert) gas that is preheated. When the gas stream is preheated by some means where burner combustion gases do not enter the dryer, the dryer known as an indirect-heated type. Often, indirect heated dryers are used when product contamination is a concern. In some cases, a combination of direct-indirect heated rotary dryers are also available to improve the overall efficiency. 1. “Heyl & Patterson Blog." The Anatomy of a Rotary Dryer. N.p., n.d. Web. 21 Dec. 2012. .